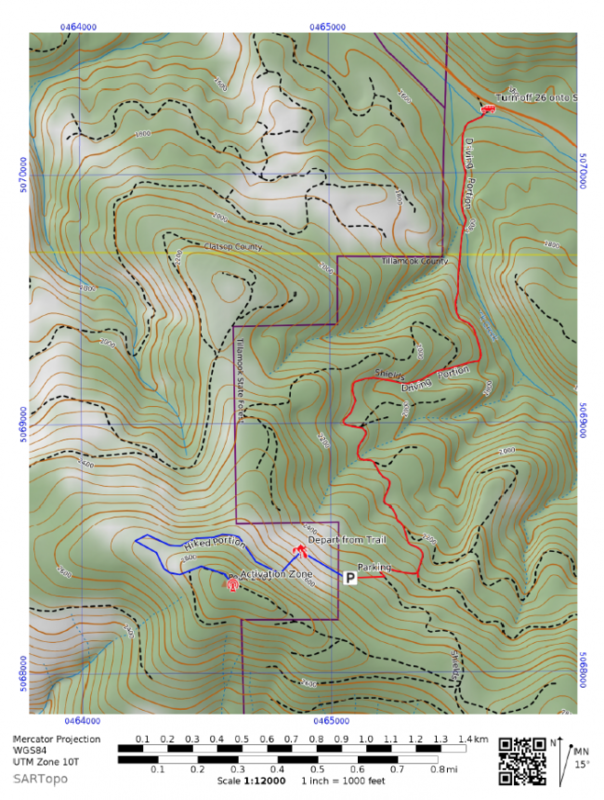 Trail Summary: The short roughly 1 mile trail starts off down an old logging road that is heavily overgrown for aproximately .1 mile to approximately 45.7691, -123.4517 where you must depart the trail taking a left and heading up hill. The next .1 miles has over 200' of elevation gain and is extremly steep and is all bushwhacking. Once you break out onto the logging road it is easy hiking the last .8 of a mile up to the activation zone. Accessing Trailhead: To get to the trail head look for 'Shields Rd' which is located on the south side of 26 just east of the rest area at 45.7850, -123.4420. Follow the map below or your GPS to the parking area and than you will have to hike from there again following the map. Activation Zone: The activation zone is fairly large and clear cut. but there are plenty of spots to guy down a small tower. There might be a few trees on the east side of the zone that are still within the activation zone if you wanted to use them for support but I would expect to use a guy'ed mast at this location. The view is great and I could clearly see Hood, Adams, and St. Helens from my chair in the activation zone. Ticks: Be aware this area was full of ticks I flicked two off myself before they were able to bite me and had to remove two from my dog whe we got home this may be time of year dependant this was in late march. Target Shooting: There is a lot of target shooting that goes on off Shields Rd. It might be worth wearing an orange cap like I did and just paying attention also don't expect silent nature the whole time. Conclusion: This isnt a bad activation at over 2900' you have a great view and I was able to get quite a few contacts in. If it wasnt for the ticks and the CQ contest I likely would have enjoyed a couple hours on this activation!